Sometimes, when you post your work, it begins to take on a life of its own. 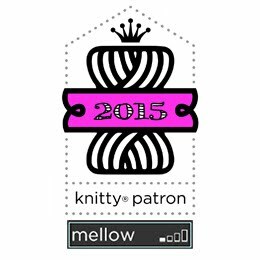 I've been a Ravelry member for a few years now, and have a project page there. 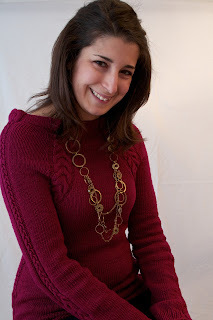 I'm also a long-time fan of Elann.com, and that's one of the 'Rav' groups I've joined on the Ravelry forum section. Apparently, the Elann staff peruse that group (why am I surprised? It's about their company, after all!) and a few weeks ago I was contacted by them about the "Silken Scabbard" -- designed by Stitch Diva Studios -- that I'd made for my daughter for Christmas, using Elann's "Sonata Soft" yarn. The company wanted me to send them the sweater (!) so that they could photograph it for their site. I would be compensated with a nice little gift certificate to use on the website. Goodness! They weren't asking for a photo -- they wanted the actual sweater! Now...I know that Canada and the US have been good buddies for years (once we kissed and made up after we won the War of 1812 and defended our sovereignty! ;-) But I digress...) and that we have the longest undefended border in the world (well, maybe some of the Customs and Immigration officers carry arms post-911) but no way was I exposing my daughter's sweater to the vagaries of international shipping! (It's one thing to send an art quilt into competition and take the risk on myself; it's quite another to risk a gift I'd given my daughter.) It would have cost me more than the compensation offered to ship it and insure it and track it...So both my daughter and I agreed -- no, we'd not send the sweater, but we would send them photos, if that were agreeable. It was -- but they didn't like the photos in the end. They thanked me graciously and sent me a (smaller) gift certificate -- which I have yet to spend, by the by. But the story doesn't end there. I was also invited to post one of our photos (my daughter took these herself) on the Elann site's Project Page, so last week, I did. A couple of days ago, I received a gracious e-mail from the President of Elann (no less!) asking if she could enter the sweater into the Project of the Month contest for March! Heaven forfend! Of course, I agreed! The prize is $100 in credit for the website's shop! And the object of all this attention? So...maybe, if you like what you see above, you might be so kind to go to the Elann Community Forum and vote pour moi? I think you may have to 'register' on the site to do this, but it's free and if you are a knitter, it's another wee bit of knitting heaven.